2009 Junior Top Guns are Go ….. Following all the celebrations of Christmas and the welcoming of the New Year our junior karters will have the opportunity for more presents during the month of January. 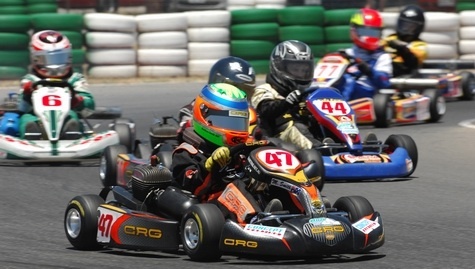 This is the time to kick off the kart racing season with the traditional “Junior Top Guns” series at Oakleigh. There will be over $700 cash for each class including $300 for the series winner, plus lots of other random prizes for all competitors. Round 2 – Friday January 23. Competitors who compete at both rounds will be automatically entered in random prize draws. ARC Engine Company are providing an ARC water cooled engine for Junior Clubman, Dunlop a set of tyres for the Midget, Rookie and for the Junior National classes. Concept Karting and Racegear along with OGKRC, are providing 2 HJC AR-10 FIA Helmets and 2 Sparco Race Suits as a random draw for all people who enter both rounds of Top Guns 2009. All competitors must remember to fit their helmets with clear visors for racing under lights.